Since 1900, the total number of school districts nationwide has decreased from 150,000 to fewer than 16,000. In New York, the decrease has been from 11,000 to around 700. Schools had to combine and serve a larger number of students from a greater area. As a result, students needed a way to get to their new schools, which might be further away. At first, it was typical for a local farmer to be paid by the state government to carry students in a horse-drawn wagon to school. Later, school wagons were purchased to transport students to their schools. The need to transport all children to school, combined with the fact that rural schools began to serve a much larger area, made school buses a vital part of public education. How does culture influence a society's education system? Describe the scene in the photograph and identify key characteristics of the American education system during this time period. 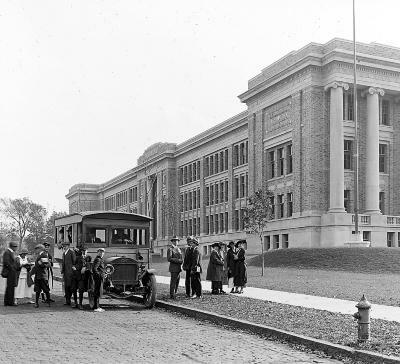 A school bus from Slingerlands unloading students at Albany High School in Albany, New York, 1915. How is this school bus different from your school bus? Research school bus legislation throughout New York State history to find the effects of busing on education. Math: What percentage of school districts nationwide can be found in New York State? Berkebile, Donald. Horse-Drawn Commercial Vehicles: 255 Illustrations of Nineteenth-Century Stagecoaches, Delivery Wagons, Fire Engines, Etc. Mineola, NY: Dover Publications, 1989. ISBN: 9780486260204.